Pastry Class with Mallory at Maja’s Kitchen! 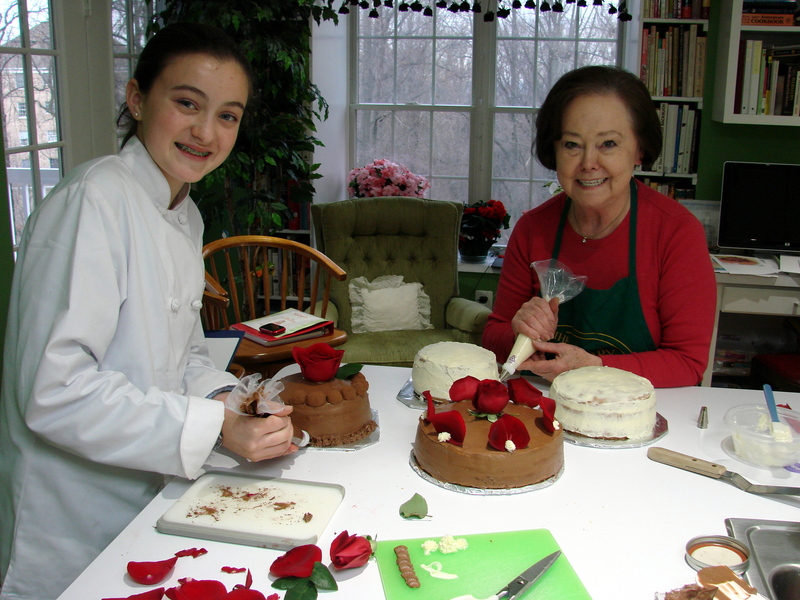 As you all know I have taught cooking classes for over 20 years…and loved every moment of it. Recently, however, we have sold our big home and have moved into a Condominium that we now call our home. Little did I know that I would be asked to teach a class occasionally here in a much smaller kitchen. At first I was concerned if it even would be possible to make it work, since the space is truly very small. The first class was with two little boys (10 and 6 years old) as I have posted earlier, who used to come to the Gingerbread House Decorating Afternoons during the month of December for many years at our old home. This past year the family was relocating to Arizona and the boys wanted to have a “cooking class at Maja’s Kitchen” before they moved. I was thrilled and did not want to disappoint them. Therefore, I quickly set up the class together with their Mom. It was great fun for all of us. Now, just a few weeks ago a friend asked if I could do a class with her friend’s daughter who creates and sells cakes as a business. Well, again I could not miss this opportunity. Mallory is 14 years old…. 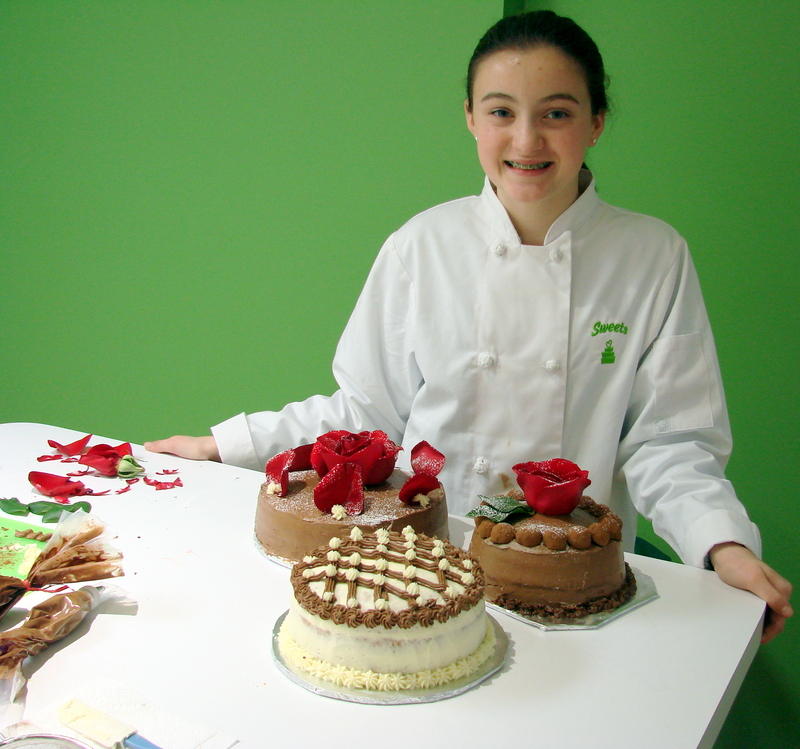 Mallory does primarily fondant work with cakes and makes cakes for special occasions for her clients, mostly children’s birthdays…. 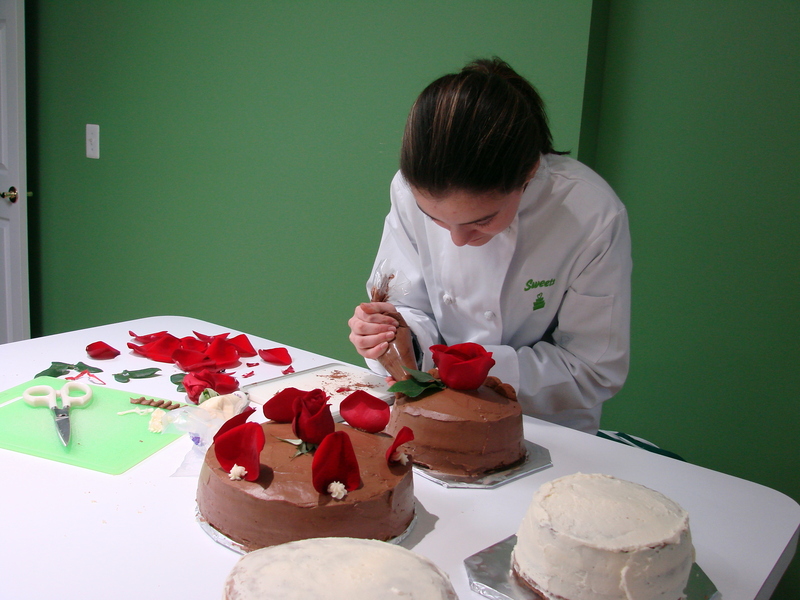 My class with her was about butter creams and decorating with plant material She wanted to learn to work in another media other than fondant. We made Austrian Vanilla and Chocolate Butter Creams. While working with her she showed me that she was a very serious student, and is truly very talented. 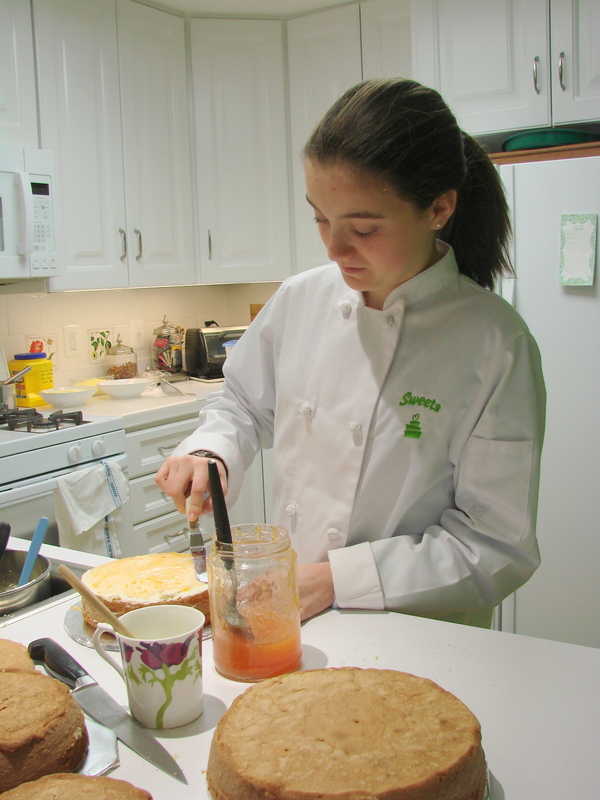 In four years she definitely will be ready for the Culinary Institute of America. We need to keep our ears and eyes open for her continued progress. In Europe…as I remember from my mother and from reading many of my Austrian and German Pastry Cookbooks that there is no distinction between an icing or a filling for a cake. 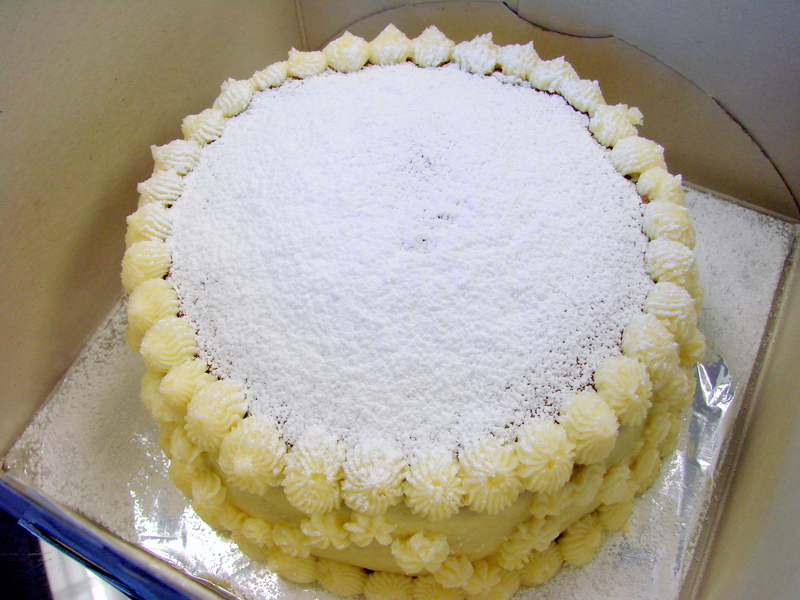 There are many fillings for cakes… many are not necessarily butter creams. When it comes to fillings for cakes there are different flavored butter creams; butter creams flavored with various alcohols, like brandy and liqueurs, as well as Vanilla, Almond, Orange, Lemon, Coffee and Chocolate flavorings. But, there are also fillings that are made from cake crumbs that are mixed with either alcohol, jams or finely grated nuts that make up the center layer of a cake. My favorite is a nut filling that is mixed with cake crumbs, nuts and brandy….. 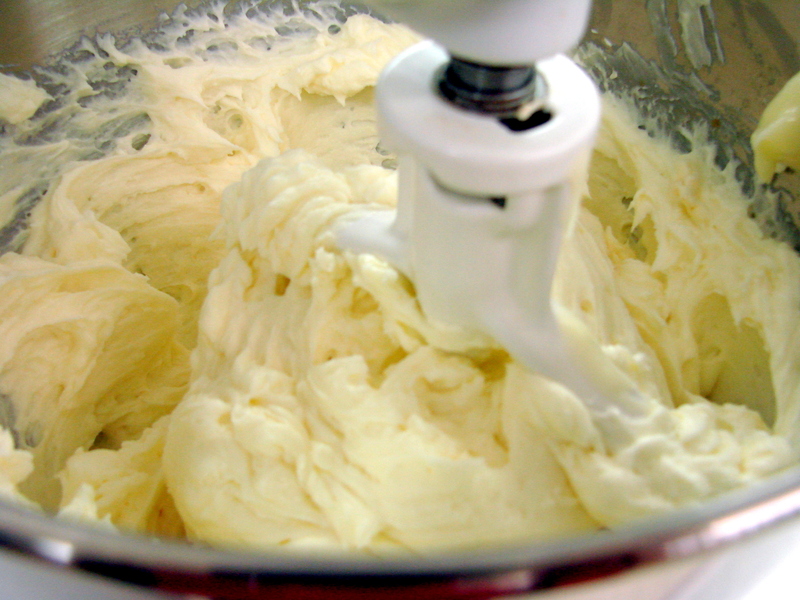 But today I will show you how Mallory and I made the Austrian Vanilla Butter Cream. You need a very thick custard cooled to room temperature and the same amount of butter also at room temperature and of course sugar but it has to be Powdered Sugar, a Vanilla as the flavor. Add the above ingredients into a sauce pan, starting with the milk, then the cornstarch and mix it well until the starch particles are well suspended in the milk, then add the sugar and the 2 whole eggs. Again, mix well until all is well integrated into the milk. Turn on the heat …to high, and cook the mixture while stirring constantly. The mixture will start to change color to a deeper yellow color; when the first boiling bubbles appears take the sauce pan off the heat and holding it in your hand mix vigorously with your other hand until the custard is smooth and silky. Sometimes I have to put the custard back onto the burner for just a few seconds to heat it just a bit more then again take the custard off the heat and mix it well until it is smooth and creamy. 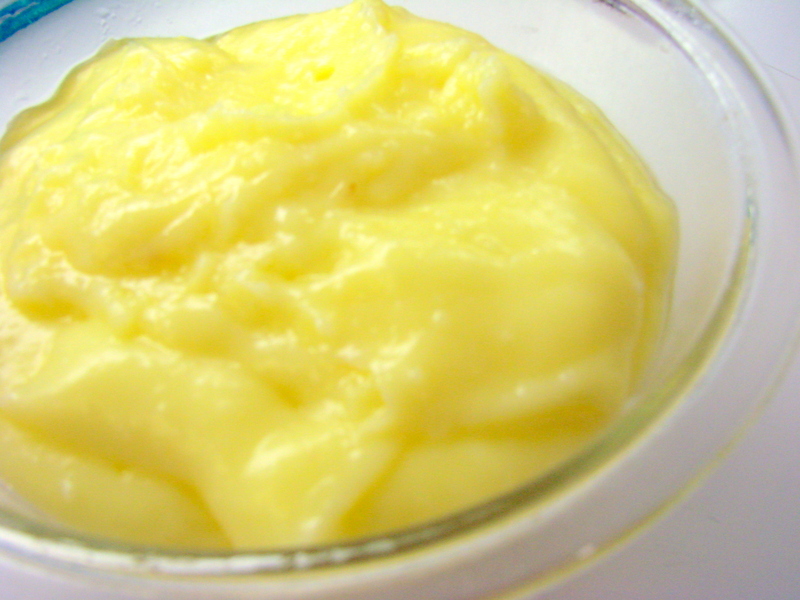 At this time the custard might appear a little lumpy, but as you keep mixing/whipping it the lumps will disappear. I usually taste it to make sure that the starch is cooked. Transfer the custard into a small glass bowl and cover it with plastic wrap. Let it cool to room temperature which will take a couple of hours at least. However, you can place it into an ice bath or refrigerator to cool it quicker. If the custard is in the ice bath then keep mixing it which speeds up the cooling process. If you have time then cool it in the refrigerator covered with plastic wrap for about one hour or so. This custard can be made a day or two ahead and kept refrigerated, but the custard will take about 2 to 3 hours to get to room temperature …or it can be microwaved, but care needs to be taken not to over heat it…then you have to go through the whole process to cool it down to room temperature again…When you are ready to start to make the Butter Cream transfer the cooled custard into your food processor and process it for a couple of minutes to make the custard smooth and creamy before adding it to the whipped butter and powdered sugar..
Add as much as you like….I start with 1 Tbsp…then add more if the flavor is strong enough to my taste…. Mallory and I had a great day together creating these Austrian Layered Cakes! Please, send me “snippets” of your thoughts….I love hearing from everyone! 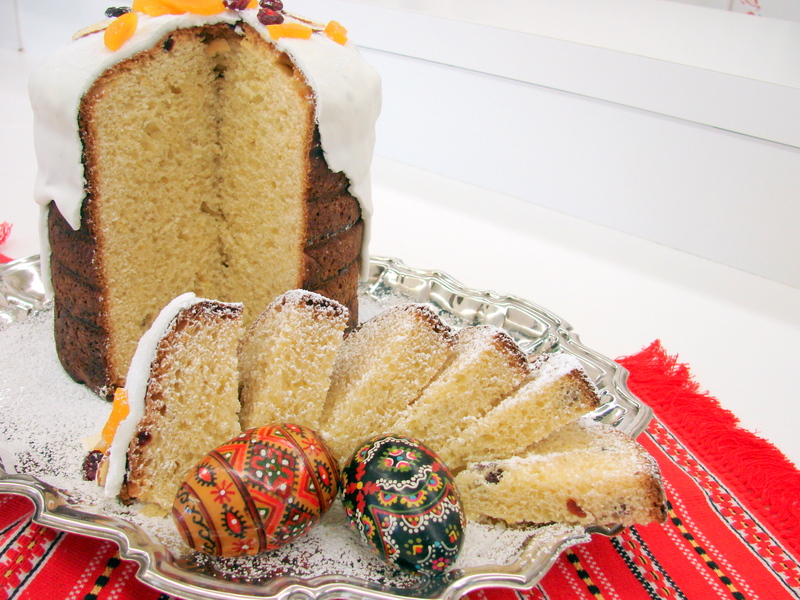 In Eastern and Central European Countries (like the area of the former Polish-Lihuanian Commonwealth, which includes Poland, Lithuania, Slovakia, Belarus, Ukraine, Western Russia and a part of northeastern Hungary) a special cake is prepared to celebrate Easter. 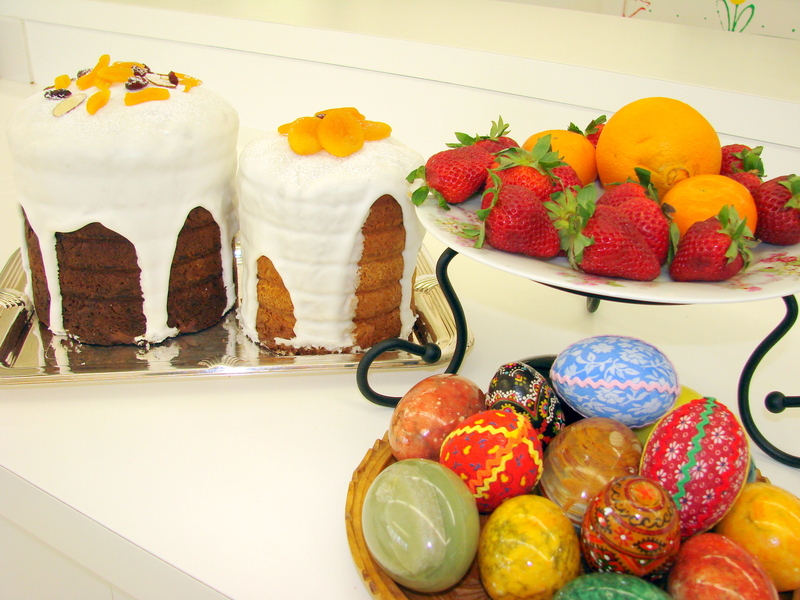 It is the Babka, also called Kulich, served with a cheese mixture that is called Paskha…. 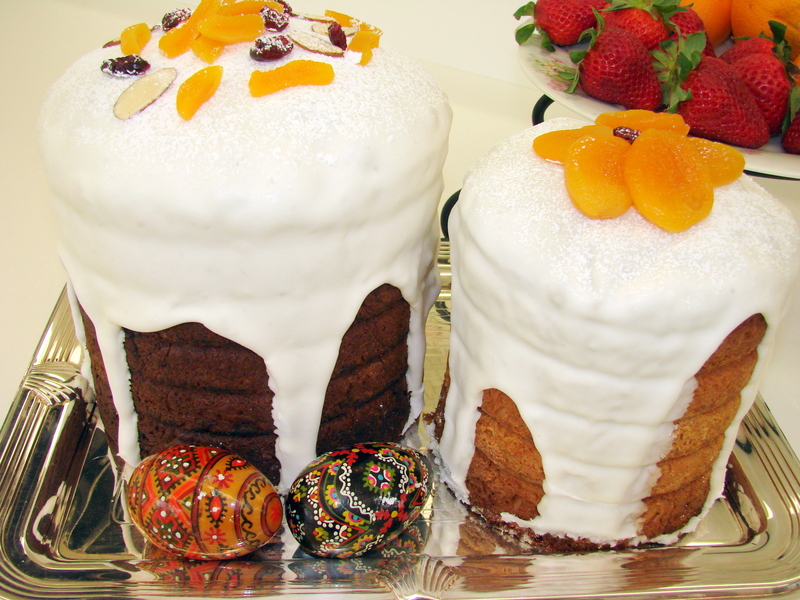 Babka or Kulich is a tall cylindrical sweet yeast cake. 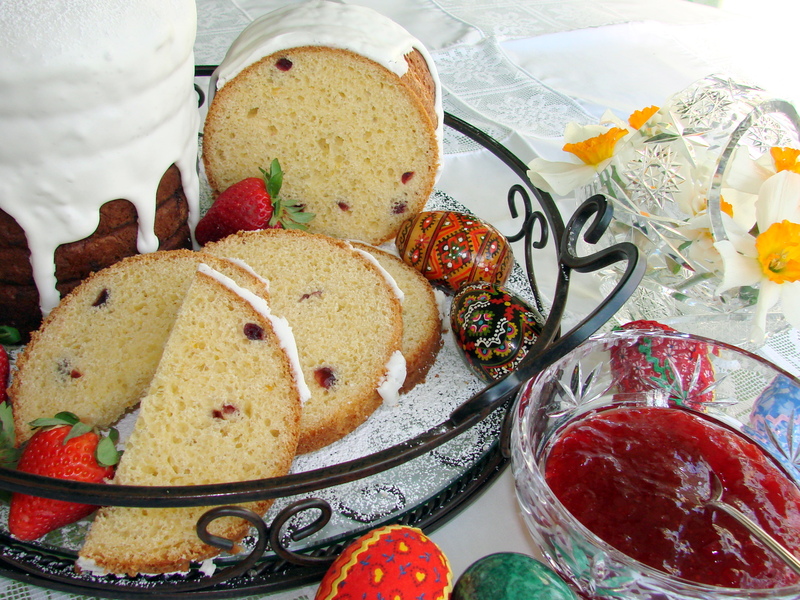 It is flavored with rum soaked raisins, and candied fruit. Sometimes Saffron is added to make the cake more yellow. However, I feel that the egg yolks give me enough yellow color therefore I do not add the Saffron. 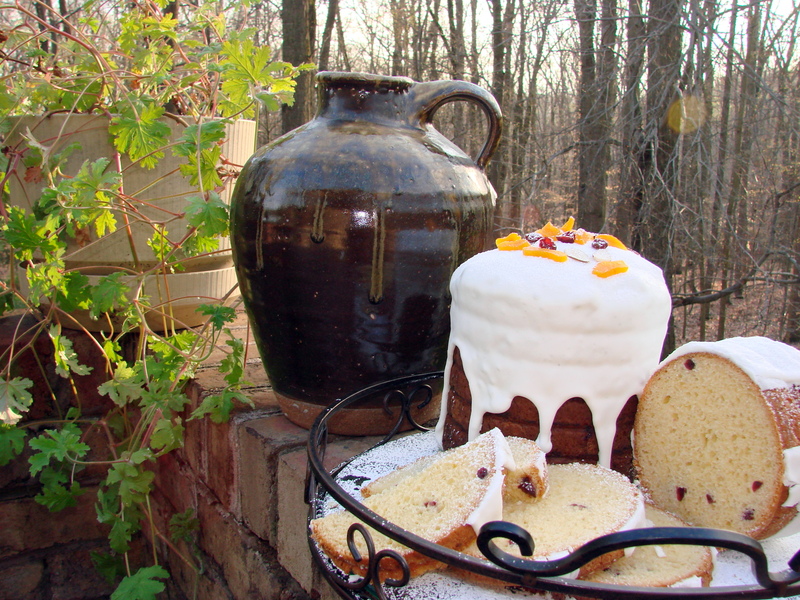 This cylindrical cake when baked is traditionally crowned with a white icing, Royal Icing, and is sprinkled with chopped candied fruit and almonds. Babka is also traditionally served with Paskha, a creamy cheese mold. It consists of a combination of sweetened Pot Cheese, or cottage cheese, nuts, mostly almonds and candied fruit. 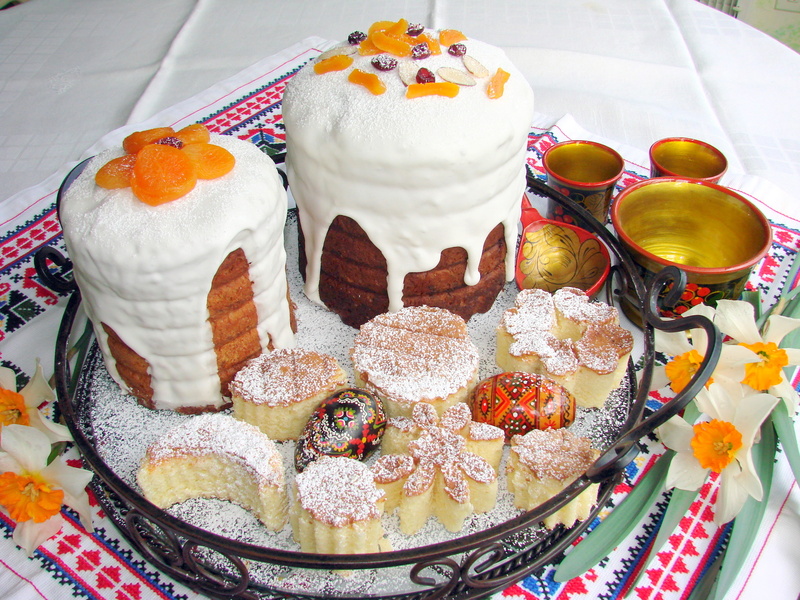 It is molded into a four sided pyramid, and decorated with nuts or candy to form the letters XB, which stands for “Christ is risen.” Paskha is the traditional and classical accompaniment for this sweet yeast bread, Babka, also called Kulich. or form the pyramid and design the letters XB on one side of the Paskha. One can also add the letters XB on top of the Paskha when served in a bowl. 1 tsp of either one. I sometimes serve the Babka with whipped cream cheese and home made jam! Warm the milk in a glass bowl in the microwave…to lukewarm. Gradually stir into the milk the two packets of dry yeast, sugar and the flour using a whisk or a fork whisking until the mixture is smooth. Cover the mixture with a towel or plastic wrap and let it sit in a warm place until it doubles in bulk. 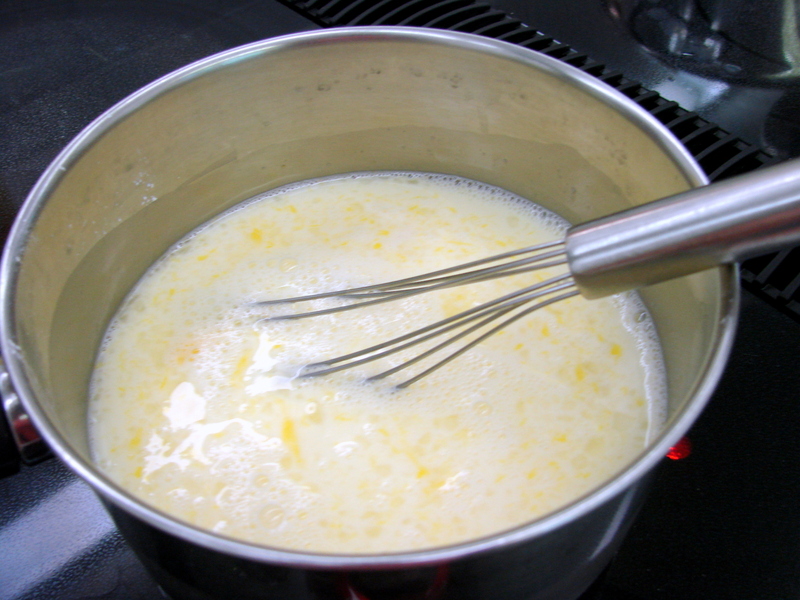 Cream butter and sugar until very creamy and add the 7 egg yolks, one at a time and mixing well between each one. Add the vanilla and the orange flavoring. Mix well. Add the risen yeast mixture and add the 4 cups of flour/salt mixture and beat well. The dough will be quite soft. to rise until it is double in bulk. 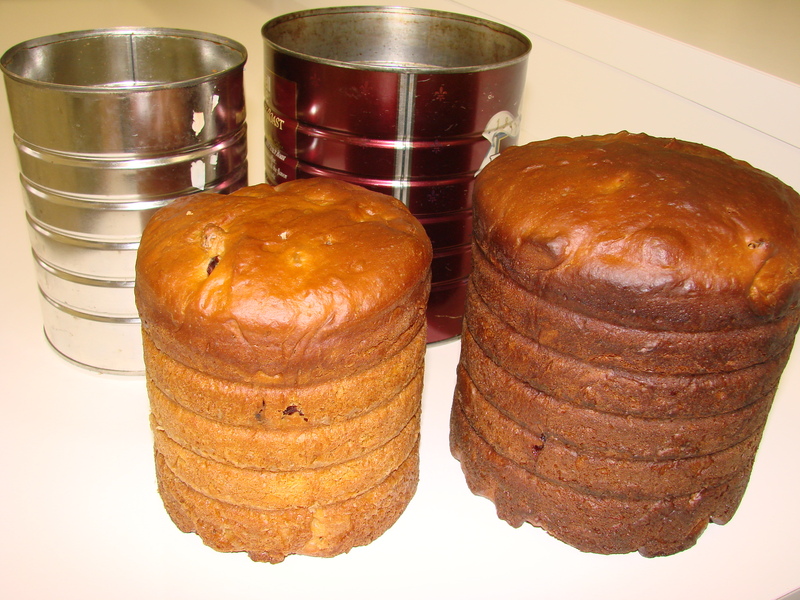 I have saved some of the metal coffee cans from the past and bake the Babka in them. However you can bake it in a Bundt pan or Kugelhupf form or even in loaf pans. It is, after all a breakfast bread. But, if you are from Russian decent and want to be traditional, look and see if you have some old 2 pound metal coffee cans in some of your kitchen cabinets hidden away. Whatever baking form you will use, you will probably need two of them, grease them; you do not need to dust them with flour and set them aside until the dough is risen and is ready to be baked. When the dough has doubled in size, mix it gently and bring it down to almost the original bulk. Fill each prepared baking form about half full with the dough, and let it rise again until it doubles in bulk. Now place it into the pre-heated 350 F oven and bake the cake about 50 to 60 minutes, depending on your oven. Watch that the top does not brown too quickly, if it does place a piece of foil over each of the cakes to slow down the browning. At about 45 minutes into the baking time, I usually check the cakes with a thermometer to see if the cakes are close to be baked. The thermometer needs to read between 190 F and 200 F to be completely baked. When done, remove from the oven and place it on a rack to cool. Do not take it out of the baking pans until it is almost completely cooled. This is a very delicate cake it will break into pieces if taken out too soon. When it is out of the baking pan let it completely cool before glazing it with Royal Icing. Place egg white and sugar into a mixing bowl and beat until very white in color and thick, but runny. Now add the 2 Tbsp of lemon juice and mix again. The icing has to be thick but able to run down the sides of the cake. Place the cake onto a plate or platter to ice them, not on the platter that you will serve the cake on your buffet. With a big spoon drop the icing on top of the cake and help it a little to run down the sides. The drips do not have to drip all the way to the bottom of the cake, but do not be too concerned when they do in some cases and puddles collect at the bottom. When the icing is quite dry, I usually let it dry uncovered overnight on my kitchen counter. Next day I gently lift it off the plate and place it on a pretty platter ready for the occasion I have planned it for. Hope you have fun preparing wonderful, not too sweet, yeast bread that will go well with either tea or coffee and the rest of your Easter Breakfast. Or………..it can be cut from the top down and then cut into little triangles. The Babka can be made a couple weeks in advance because it freezes well, however the decoration with the Royal Icing needs to be done after the cake is thawed and before it is served. I do it the night before the breakfast. To freeze it I wrap the cake with three layers of plastic wrap before I place it into the freezer. I wish you all a wonderful and Happy Easter! Find me on Face Book! Here in Maryland we have had a very serious winter this year. 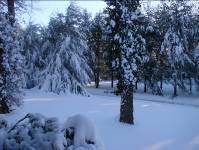 One snow storm after another pounded the land of unsuspected inhabitants. The first snow was a most glorious sight! 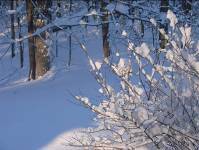 From our windows we marveled at the purity of the white blanket that covered the landscape around us. 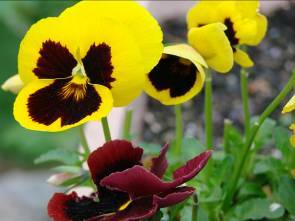 Soon however, we became tired of this beauty and are now longing for spring. There is still snow on the ground, where in the past, at this time of year, the daffodils were already nodding to the soft breezes of spring. In Maja’s Viennese Kitchen…… I have been busy with various activities these past two months, some that needed serious continuation from last year and others that are new and exciting. Last year I started attending a writing class at Notre Dame /Renaissance Institute to improve my writing skills. It has been a wonderful experience with other writers discussing and editing my stories that I am preparing to compile into a memoir cookbook. I am hoping to have a book published by the end of this year. But, not only have I worked with these wonderful ladies, but have had great and continuous help from my daughter-in-law who is an excellent editor and corrects my writing but never distorts my writing voice. Writing this book has been such great pleasure and is a most stimulating experience for me. The most recent exciting occurrence happened when I was asked to teach cooking classes at the Williams-Sonoma Store. It has been a great experience and really fun. Since this store is practically in my neighborhood, only 15 minutes away from my home, it is most convenient. My first class was all about German/Austrian recipes; it was about Kraut…..cabbage! The recipes that are presented in these cooking classes all come from Williams-Sonoma Cookbooks, however since Williams-Sonoma does not have any Kraut recipes in their cookbooks I was asked to pull out some of mine. The three recipes that I taught were Wiener Schnitzel, Sauerkraut, and a Sautéed Red Cabbage with various sausages. Everyone loved my grandmother’s Austrian creamed Sauerkraut and sautéed red cabbage, both with apples to tone down the harshness of the cabbage. The Wiener Schnitzel was served right out of the hot pan and was still sizzling while being placed on the plates for tasting. I love teaching at Williams-Sonoma……it is a beautiful store. I feel like a child in a candy store with all the wonderful kitchen and table merchandise.